I’m not usually a fan of faux meat products, but once in a while I crave the texture and flavor of a comfort food like chicken tenders or in this case, pan-fried sausage. 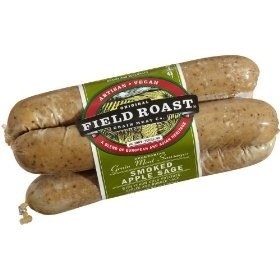 Most of the time I love a good panko crusted veggie, fried tofu or crispy eggplant but I must say, Field Roast “sausage” is de-liscious!! Filtered water,vital wheat gluten, expeller pressed safflower oil, nonsulphered dried apples,yukon gold potatoes, naturally flavored yeast extract,onion powder, barley malt,garlic, natural hickory smoke flavor with torula yeast, sea salt, spices and rubbed sage. Add package of gnocchi (you don't need to boil first) and more olive oil. Cook until browned. Season all with salt & pepper and more sage if desired. 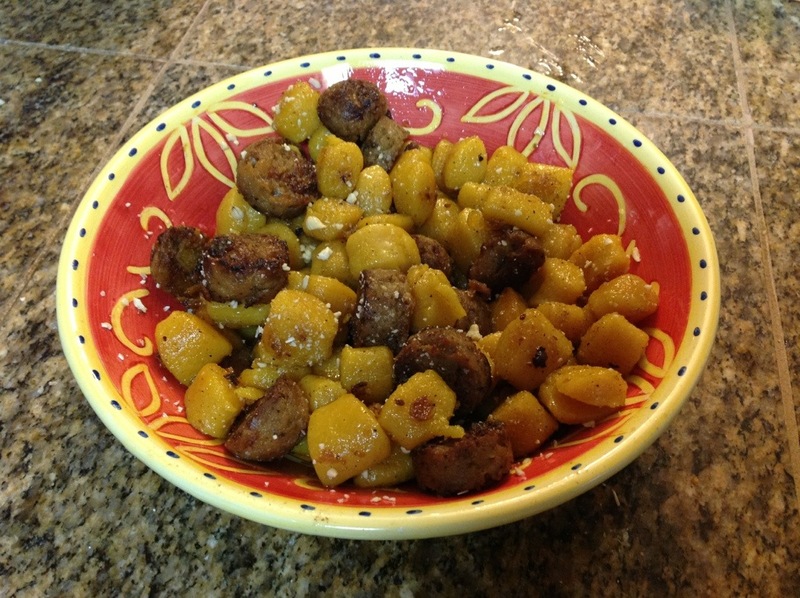 We used Pumpkin Gnocchi this time, and sprinkled a bit of grated Brazil Nuts over top. 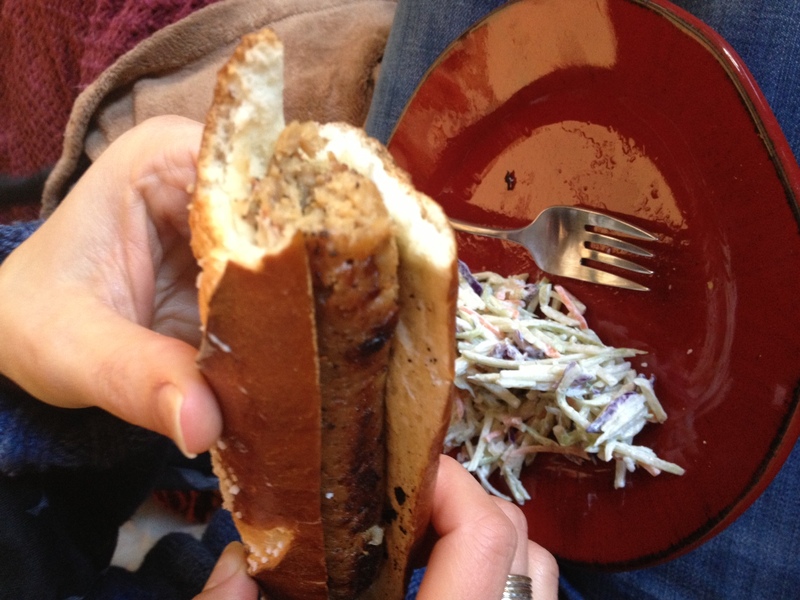 The next day, we split some soft pretzel rolls and added some pan-fried sausage with a bit of broccoli slaw on top…equally YUM. Seriously quick pix…they were devoured quickly! Sometimes you just want a big ‘ole sandwich to sink your teeth into. I also wanted something flavorful enough to stand up to my delicious heirloom tomatoes. We loved the bite of the crisp tofu with the juicy warm tomato and creamy avocado on a toasted kalamata olive roll. This would be great on toasted multigrain bread too! I was inspired when I saw this picture on Happy Healthy Life. Cut tofu block in half. Press tofu or use a kitchen towel to squeeze them dry. Whisk juice from lime, miso paste and few turns of cracked black pepper. Smear tofu with paste, heat a pan over high heat and spray with oil. Sear tofu on each side; (about 1-2 minutes per side) don't move it until it's browned, then flip. Sprinkle sliced tomato with garlic salt and then broil in oven with cheese (optional). Assemble with avocado slices and spinach. Thank you so much Kathy at Happy Healthy Life for the inspiration! Yum! 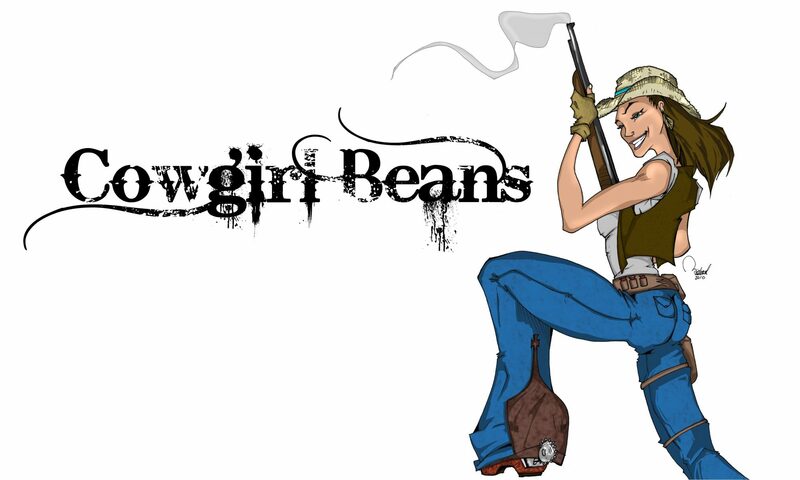 Check our her original recipe here.